John Frith was born in 1503 in Westerham, Kent to Richard Frith, innkeeper of the White Horse Inn. Frith was educated at Sevenoaks Grammar School before transferring to Eton College and later Queen’s College, Cambridge, although Frith received his BA from King’s College. Whilst at Cambridge he studied under Stephen Gardiner and read Latin, Greek and Mathematics. It was also here that he met Thomas Bilney and they began discussing the Reformation, it was during these meetings that Frith met William Tyndale for the first time. Upon graduation Frith became a junior canon at Thomas Wolsey’s Cardinal College, Oxford however, this did not last long Frith along with nine others were accused by the University of possessing heretical books and were imprisoned in a cellar for six months. Upon his release Frith left England to travel to Antwerp to join up with William Tyndale. Frith spent many years in Europe and during this time he translated a number of works including, ‘A Pistle to the Christian Reader: The Revelation of the Anti-Christ’; ‘An Antithesis between Christ and Pope’. He also published his own works in response to Thomas More, Bishop Fisher and John Rastell entitled ‘A Disputacion of Purgatorye’. Unpon reading Frith’s work Rastell converted to the Protestant ways. In 1532, Frith returned to England and was quickly arrested in Reading where he was mistaken for a vagabond with the help of Leonard Coxe, a local schoolmaster, he was released. Sir Thomas More, when he learnt that Frith had returned to England issued arrest warrants for Frith’s capture on the charges of heresy. Frith was eventually arrested when trying to board a ship back to Antwerp. 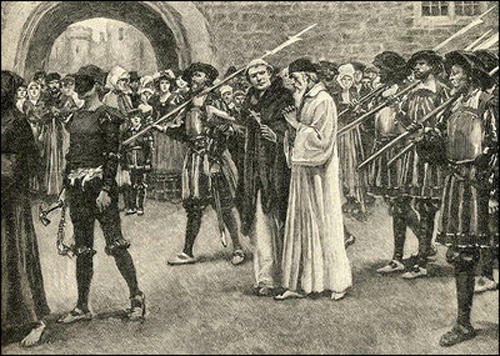 Frith was sent to the Tower of London where he continued to preach and write about the Lutheran ways and in particular the ritual of Communion, knowing that his work would be used against him as evidence. Whilst Frith was imprisoned Sir Thomas More resigned as Lord Chancellor after disagreeing with the King’s views on religion and a short time later following the death of William Warham, Thomas Cranmer was appointed Archbishop of Canterbury. Also Cranmer himself leaned towards the Lutheran way he met with Frith at both Lambeth and Croydon for discussion in which Cranmer attempted to persuade Frith to change his stance regarding the Eucharist to be more in line with that of the King. Cranmer was trying to save Frith’s life but Frith was unwilling to change his belief. Frith was eventually moved to Newgate Prison where he continued writing; he received letters from William Tyndale who attempted to keep Frith’s spirits up. However, Thomas Audley was given the office of Lord Chancellor and he sentenced Frith to stand trial. Frith was placed before a jury of examiners and bishops and here he submitted his own writings as evidence of his personal views that were considered to be heresy. Frith was offered a pardon if he answered positively to two questions the first was ‘Do you believe in purgatory?’ the second was ‘Do you believe in transubstantiation?’ Frith replied that neither could be proven and with that he was condemned as a heretic and sentenced to death by burning on 4th July 1533. Frith’s views would continue to live on and after the death of King Henry VIII, Cranmer subscribed to the same views as Frith regarding purgatory and the Eucharist and these were implemented into the Protestant reforms during King Edward VI’s reign.